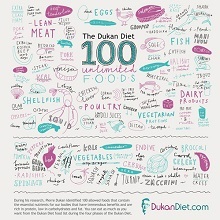 “Dukan diet” is the name given to the nutritional approach designed by French dietitian and nutritionist Pierre Dukan. This plan is based on creating a diet plan similar to what the hunter gatherers used to eat. The diet plan includes a total of 100 foods of which 28 are plant-based and 72 are animal-based. A dieter is free to as much as they want while sticking to these 100 foods. This whole diet plan is divided into four separate phases namely attack phase, cruise phase, consolidation phase and stabilization phase. This diet was created in the year 2000 and it claims to help people lose around 10 pounds of weight within just one week on a permanent basis. In the attack phase, the goal is to lose 4 to 6 pounds of weight within a period of 2 to 10 days. The plan is designed to kick start the metabolism. In this case, the dieters are expected to eat only lean protein without any calorie counting. The only condition is that protein should be low in fat. It can be beef, cottage cheese, soy, eggs, chicken and fish. One is expected to avoid meats that come with added sugars. The only carbohydrate source that is allowed in this phase is 1.5 tablespoons of oat bran. This is the source of dietary fiber. It also helps in suppressing appetite as it can grow up to 20 times its size by absorbing water. In this phase, the dieter is also supposed to consume at least 1.5 L of water each day. The next page is called the cruise phase. In this phase, dieter can eat 28 specific vegetables but no fruits are allowed. The length of this phase depends on the weight loss goal of the dieter (2.2 pounds of weight loss per week). In simple terms, if your goal is to lose 20 to pounds of weight, this phase is going to last 10 weeks. Non-starchy vegetables can be consumed in unlimited amount. Some of the vegetables allowed in this phase are green beans, spinach, and okra while peas, corn and carrots are not allowed. Also, dieter is free to eat all the low-fat protein food from the first phase. The consumption of oat bran and 1.5 L of water continues. The dieter has to alternate between vegetables and lean protein on a continuous basis. For instance, if you are going to eat lean protein on a day, you need to eat low starch vegetables with lean protein on the next day. The next phase is the consolidation phase and the goal of this phase is to prevent lost weight from coming back on. In this phase, the dieter can consume unlimited amount of vegetables and protein on a daily basis along with two slices of whole grain bread, one portion of cheese and one piece of raw sugar fruit. Dieters may also have 1 to 2 servings of starchy food along with a maximum of two celebration meals in a week. There are no restrictions on celebration meals. The dieter has to eat lean protein one day in a week during the consolidation phase. The last phase is the stabilization phase and it is the maintenance part of the diet plan. In this phase, dieters are free to eat whatever they want but they need to follow some simple rules. Dieters have to eat at least three tablespoons of oat bran on each day of this phase. They also need to go for a 20 min walk and they should never take elevator or escalators. They also have to have an all-protein diet once in a week. The dieters are expected to follow these rules of the stabilization phase for the rest of their life and make them part of their lifestyle. Dieters are free to eat spices, sugar free gum as well as artificial sweeteners. Multivitamins with minerals is also recommended. While many people have compared this diet with Atkins diet over the years, there are some major differences between these two types. « Ageless Body System Review – A Real Anti-Aging Solution?